INDIANAPOLIS (October 9, 2013) — Klipsch, a leading global speaker and headphone manufacturer, today announces the launch of its SB 120. As a 2.1 speaker system with Bluetooth® wireless technology, the product provides a new aesthetic solution for vastly improved flat-panel television sound. 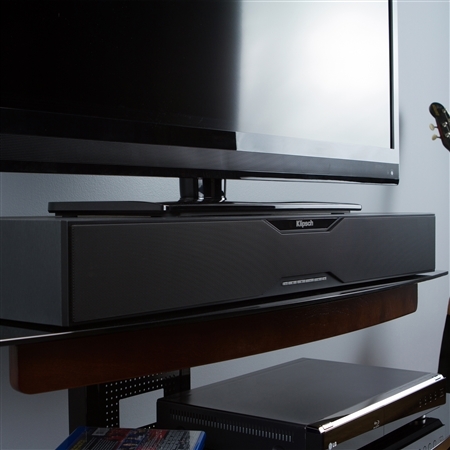 A more discreet alternative to both multiple speaker and conventional soundbar systems, the SB 120 is designed as a single cabinet, single connection sound solution that rests underneath a television on a stand, shelf, dresser or countertop. Built to redefine the home theater experience, the speaker system combines legendary Klipsch horn-loaded technology with separate midrange drivers and dual subwoofers for dynamic, full-range sound. TV shows, movies and gaming all sound much more lifelike with extended dialogue clarity. Serving as a three-way sound solution with built-in dual subwoofers, the SB 120 utilizes lightweight aluminum tweeter diaphragms for distinctive high-frequency detail, as well as long-throw woofers for extended bass response. In addition, the tweeters are coupled to Klipsch-exclusive Tractrix® Horns to both reduce distortion and increase dispersion more directly to the main listening area. The SB 120 includes Bluetooth wireless technology, allowing it to double as a premium music playback device with simple wireless streaming of one’s favorite music from compatible stored music devices. Additionally, the SB 120 features Dolby® Digital decoding for quick, one-connection setup with most televisions as well as switchable, 3D surround mode to simulate a multiple speaker surround system. Ease-of-use is maintained with both uncomplicated programmability to most existing remotes and an included full-function remote control.